With images, the richer the expression and the more detailed the nuances, the more powerful the emotion. The new Sanyo LCD high definition home theater projector Z5’s “brilliant cinema” mode with bright, vivid images let you experience home theater viewing with tremendous emotional impact. Now with Sanyo Z5 you and your family can enjoy picture quality movies at home. The stylish and attractive Sanyo LCD high definition home theater projector Z5 looks good in any room and can be placed just about anywhere. The horizontal and vertical lens shift function, allows you to adjust the screen projection easily, without having to move the actual body of the projector. The shutter of Z5 can be opened or closed automatically by remote control- no longer have to manually attach or remove the lens cap. The Advanced Mode provides a range of adjustments to match your viewing requirements. Adjustments include RGB gain, RGB gamma, RGB offset adjustment, lens iris adjustment, outlines compensation, black level expansion, and contrast enhancement. The redesigned internal structure and maximized cooling efficiency assures super-quiet performance. The Z5 comes equipped with two HDMI (Hight Definition Multimedia Interface) terminals along with one component input. The HDMI terminals expand your viewing options and an electrostatic air filter prevents dust particles from being sucked into the inside of the projector. With its 2x optical zoom, the Z5 projects images onto a 100″ screen from a throw distance of 3 to 6.1 meters and the illuminated buttons on the multifunction remote control ensure easy operation, even in the dark. 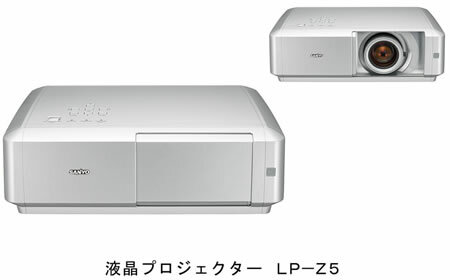 The Sanyo LCD high definition home theater projector Z5 measures 382×126.8× 304.3mm, weighs 5.0kg and will be available from 20th October for approximately 294000 Yen ($2500).